A 14-acre alfalfa field south of Fabens has been affected by an undetermined leafminer, possibly the American Serpentine Leafminer (ASL), Liriomyza trifolii. This field had areas with severely damaged plants next to areas with plants that had little damage. Approximately 30% of the field was affected. I recommended an early harvest and immediate removal of the alfalfa to reduce both the pest and susceptible host. Additionally, that field could also benefit from prompt irrigation. A sample of adult leafminers was submitted for species identification. Dr. Scott Armstrong, a research entomologist with ARS-USDA in Weslaco, TX, reports that this species has been a problem in cotton and vegetables in southeast Texas this year. ASL is one of the most widespread and economically-important leafminers in the world. It is a very polyphagous leafminer species that feeds on a wide variety of row crops, ornamentals, weeds, and native plants. Therefore it can maintain continuous populations even when crops are not in cultivation (C. E. Stegmaier Jr., The Florida Entomologist, Vol. 49, No. 2). In general, leafminers can become key pests in crops where insecticides are used excessively. Usually, leafminers are kept in check by natural enemies, especially small wasps that parasitize eggs, larvae, and pupae stages. They are called “parasitoids”. Parasitoid is defined as an organism that, during its development, lives in or on the body of a single host individual, eventually killing that individual. Sometimes there are also “hyperparasitoids”, which are parasitoids that develop in other parasitoids. The leafminers are very tiny insects so you can imagine the size of its associated hyperparasitoids. When insecticides are applied too frequently, the populations of natural enemies may crash and this results in leafminer outbreaks. 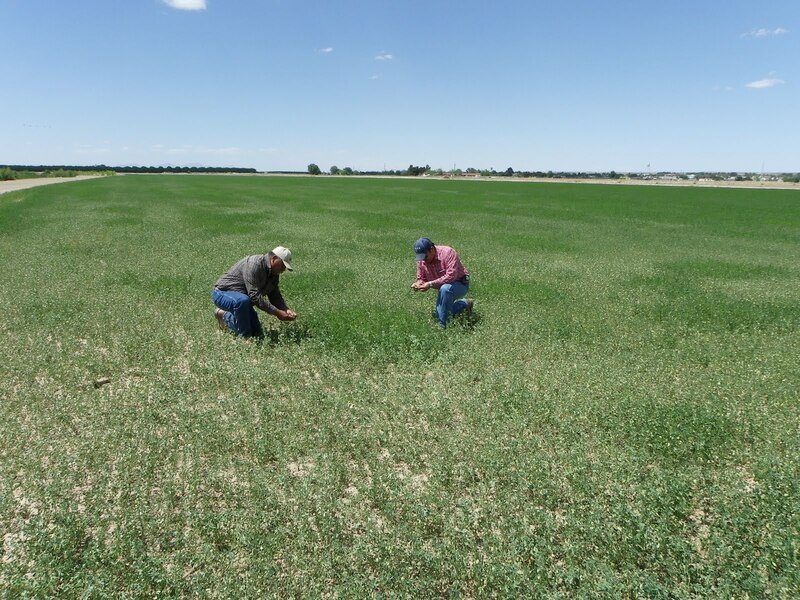 Interestingly, alfalfa fields in our region receive very little insecticide applications, if any. The good news is that we are definitely not dealing with the Alfalfa Blotch Leafminer, a major alfalfa pest in other parts of the country; especially the Midwest.